I found this book fascinating, as I love African culture and cuisine, however in practice this book is confusing and impractical for most home cooks. A beautiful coffee-table paperback, but not a truly usable cookbook for North American lifestyles. SAN FRANCISCO – Helping to pass along the recipes used for generations by the women in her family, “Ethiopian Cookbook” by Konjit Zewge includes traditional Ethiopian cuisine for meat eaters, vegetarians and vegans. The book was originally written in Amharic and translated to English by Zewge’s daughter, Mesrak Mekonnen. 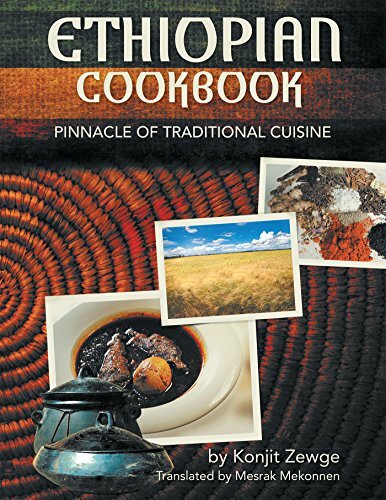 This book shares the ingredients and preparation methods for a style of cooking that characterizes Ethiopian cooking. The book also includes a glossary to explain important terms for cooks of all skill levels. Ethiopian dishes are usually prepared in stew forms and almost always served with ‘injera.” The main ingredients are meat, grains, and legumes. Red meat and chicken are prepared with butter, while fish, legumes, and grain dishes are prepared with oil. Konjit Zewge, at the age of 89, documented her succulent dishes in her book “Yemouya Kouncho.” She wrote her book for the sole purpose of passing the art of preparing traditional Ethiopian cuisine to the next generation. Her parents' home was always filled with extended family, neighbors and other visitors who delighted in the savoy dishes. Running the household was traditionally the women's job and learning how to prepare food started at an early age. As an ardent student, Zewge made it a point to write down procedures, the various ingredients and amount used in recipes. Her book has been translated to English by her daughter, Mesrak Mekonnen. Mekonnen lives in San Francisco. Your posts have more meaning for me. thanks for write my essay sharing.